What are Russian Eggs? The egg is an important element in many ancient cultures, symbolizing life and new beginning. One of the legends about Easter eggs says that in order to share the Good News Mary Magdalene once brought a red painted egg to the emperor Tiberius with the words Christ is Risen. She chose an egg because she was very poor, but in order to attract his attention she dyed it red. According to another version of the same legend, the egg was completely ordinary (i.e. white), so the emperor replied to the words about Christ's resurrection saying that the dead couldn't be brought back to life, just as a white egg couldn't become red. And at that very moment a miracle happened – the egg turned red all by itself. 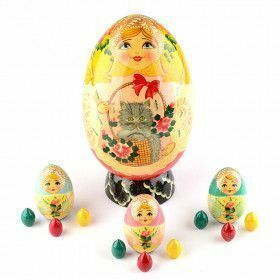 Faberge eggs, wooden eggs, Pisanki eggs, crystal eggs, Nesting doll eggs... 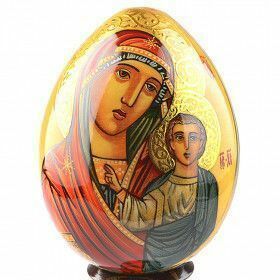 The egg is a symbol of life across many cultures, but it has special significance in Russian folk art, that has survived into the modern day. The egg is an important element in many ancient cultures, symbolizing life and new beginning. One of the legends about Easter eggs says that in order to share the Good News Mary Magdalene once brought a red painted egg to the emperor Tiberius with the words Christ is Risen. She chose an egg because she was very poor, but in order to attract his attention she dyed it red. According to another version of the same legend, the egg was completely ordinary (i.e. white), so the emperor replied to the words about Christ's resurrection saying that the dead couldn't be brought back to life, just as a white egg couldn't become red. And at that very moment a miracle happened – the egg turned red all by itself. However, the eggs played an important role in life of early civilizations even before Christianity. People colored eggs in ancient China, Greece, Rome, and even Egypt where it was considered a symbol of life-giving seed. The tradition of coloring eggs is observed also by Armenian Apostolic Church, the Maronite Church and by Syro-Yakovite Orthodox Church. 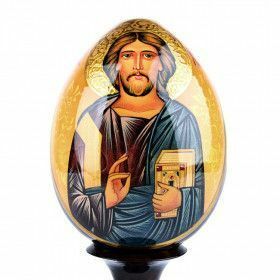 In Russian Orthodox culture, eggs play an especially important part as one of the elements of Easter celebration. In Russia, there are two main types of colored Easter eggs: pisanki and krashenki. The difference between them is that "krashenki" are boiled eggs dyed a single color (with vegetable dyes, traditionally onion skin). Their traditional color is red, but in modern Russia all kinds of colored eggs are made for Easter. Pisanki are normally richly ornamented using several colors. Stone, clay and bone versions of pisanki were excavated throughout Russia and Ukraine, many from the graves of children and adults. These ceramic eggs were common in Kievan Rus', and had a characteristic style. They were slightly smaller than life size (2.5 by 4 cm, or 1 by 1.6 inches), and were created from reddish pink clays. It is known that they were not only used locally, but also exported to Poland, as well as to some Baltic and Scandinavian countries. 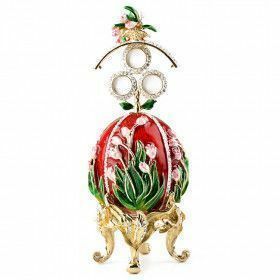 The best known Russian eggs are of course those made by Carl Faberge. They were specially ordered by the Russian Tsars at the Emperor Porcelain Manufacture. Those eggs are of extremely high artistic value. Carl Faberge made truly unique, exquisite gifts for the royalty and aristocrats. 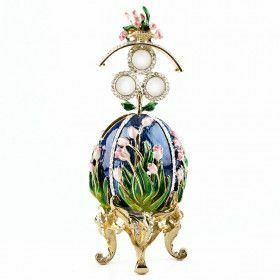 Here you can read more about the Faberge style and the history of the famous series of 50 jeweled Imperial Easter eggs. Only the wealthiest people could afford the masterpieces created by Carl Faberge. But starting from 1820s a lot of private factories appeared, and mass production of Easter eggs started. So decorated pisanki eggs were sold everywhere. Some were even painted by icon painters – that's how important the tradition was for the Russian people. Easter eggs were placed in the so called "red corner" – the most important and honorable part of the house where the home iconostasis was. That's where the prayers were said and where the most important things were treasured. One of two were given to the priest. Several eggs were taken to the cemetery to be put on the graves of the deceased family members. Some eggs were given to children or godchildren. Unmarried girls exchanged eggs with the unmarried men in the community. Everybody received at least one egg on Easter Sunday. Nobody was left without this symbol of new life and hope. Some eggs were even placed in the mangers of cows and horses and put in the nests of hens because people believed that the eggs could somehow help and even protect them. That may sound odd now, but it shows how important the eggs were to ordinary people. Nowadays pisanki eggs are an essential element of Easter celebrations. Hand-painted and exquisitely decorated crystal and wooden eggs make a wonderful gift that will be treasured for years.